After the tragic passing of Robin Williams on August 11, 2014, I found myself going back and watching some of my favorite movies that he starred in (Can’t get enough of that genie in Aladdin and Good Will Hunting has Matt Damon, Ben Affleck, AND Robin Williams, so you can’t pass that up!). I also found myself wondering what would be his last movie, found this article detailing what they would be, and made a note to check them out. I was finally able to check one of them out! 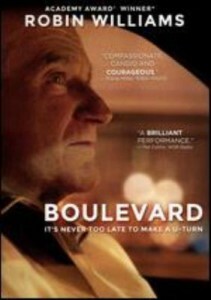 One of his last movies was Boulevard, starring Williams as Nolan Mack, a married, yet closeted, bank employee in his 60s and what happens when he decides to take a different way home one night. Nolan has a lot on his plate. He has been working at the same bank for 25 years, has been offered a promotion to branch manager which requires a lot of prep work, and has an elderly father in the hospital. His home life seems to be idyllic, except for the tiny fact that he and his wife, Joy, sleep in separate bedrooms and seem to have entirely separate lives. On his way home after visiting his father in the hospital, Nolan finds himself driving down an unfamiliar street. Sitting at a red light, he decides to turn around. After almost hitting a young man crossing the street, Nolan offers the young man a ride to wherever he was heading, discovers he’s a prostitute, and finds himself in a hotel room with young Leo, confronting issues in his life that he had hoped to keep buried. Needing Leo in his life more than he realizes, Nolan soon finds himself deviating from the comforting and familiar bearings of his life, his work, and his marriage in order to fully become his true self.